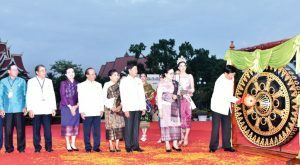 Vientiane (Lao PDR) – October 30, 2017 (travelindex.com) – Prime Minister Thongloun Sisoulith invited people from around the world to visit the nation in remarks he delivered to officially launch “Visit Laos Year 2018” in front of the capital”s revered That Luang Stupa on Saturday. A ceremonial gong was struck nine times by the prime minister to mark the official opening of “Visit Laos Year 2018”. “On this occasion, I”d like to invite all tourists from Laos and overseas to visit Laos, with joy and happiness throughout the year and forever,” Mr Thongloun said. The launch of “Visit Laos Year 2018” coincided with the start of the annual That Luang festival which features a trade fair, a display of traditional houses, cultural performances and activities relating to traditional worship rituals at That Luang Stupa as well as cultural, religious and spiritual events. The launch highlights included performances of songs and dances. Minister of Information, Culture and Tourism Professor Dr Bosengkham Vongdara also delivered a speech at the event, which was attended by hundreds of people including government leaders, foreign media and invited guests from Laos and abroad. The minister underscored the importance of the tourism industry which has expanded rapidly in countries around the world. “In recent years, the government of the Lao PDR has likewise come to regard tourism as a priority sector for driving socio-economic development,” he said. Professor Dr Bosengkham said tourism is a form of export and generates income to local and rural communities in remote regions. But critics raised questions about how the government can best promote Laos to the rest of the world when the amount of information available is limited. Editor-in-Chi ef of e-Global Travel Media, Mr. Stephen Morton, said Laos has great potential to offer experiences to international visitors, but needs to improve accessibility (visa facilitation) and ensure more information is available. For instance, the event calendar related to festivals and activities must be readily available so that more tourists can plan on attending those events. Improvement of infrastructure and services including road access to tourist attractions and internet speed is also critical. The government has organised Visit Laos Year on two previous occasions, once in 1999-2000 and again in 2011-12 to encourage more tourists at home and abroad to visit sites within the country. By 2015 the figure had risen to 4,684,429 people, generating some US$725,365,681 in revenue. It is projected that tourist arrivals will reach about 6,206,423 people by 2020 and generate revenue amounting to US$993,427,000. To better promote the ‘Visit Laos Year 2018’ campaign, the government approved six slogans: ‘Warmly Welcome to Visit Laos Year 2018″; “Laos Jewel of the Mekong”; “Laos Simply Beautiful”; “Be the Good Host for Visit Laos Year 2018″; ”Visit, Enjoy, Safety, Environmentally Friendly”; ”Visit Laos, Experience the Diversity of Nature, Culture and History”. The trade fair features more than 1,000 booths at two venues: Lao ITECC (460 booths) and That Luang Esplanade (640 booths).